Need to track assets betters? We wrote a 25-page whitepaper on the asset tracking Location Engine technology. Here’s what we found. Beacons don’t work in a vacuum. They may need an app or other technologies to reach their highest functionality. In order to get the most out of beacons in asset tracking, businesses are turning to tools that make beacon data accessible and actionable. Location Engine technology shows where specific beacons are located, how much time they have spent in range of a given Gateway, at what time they entered and left an area, and other kinds of useful information. We are following up our successful Location Engine webinar with a 25-page guide to help you get started with asset tracking. This paper dives into the technical details as well as how to measure success and find the right use case. More is not always better. Businesses need the right amount of beacons and data in order to be manageable and profitable. Zonal Tracking focuses on larger areas, pinpointing the relative location of an asset, and removing unnecessary data and technology. Can a large area be covered by multiple Gateways? Yes. Gateway coverage depends entirely on the beacon tag, which is fully definable between 1 and 60 meters. However, multiple Gateways can be used in a space in order to approximate location within the area. Can the beacons be branded? What are example ‘Item’ use cases and types? Items can be used to fit any use case or need. For example, individuals over 30, entry-level employees, assets older than 5 years. Can the system be installed and managed on a local server? Yes. Whether for regulatory or connectivity purposes, the system can be locally installed, pointing the Gateway to a local server and network. This allows the user to get direct access to data. Is it possible to find accuracy when between two rooms? Yes. Proximity of a beacon to a Gateway can be used to determine in which area the beacon is located. What is the security model used? The beacons themselves are fully encrypted. The Gateways are closed and secured by HTTPS. Is it possible to determine where someone is within a particular room? Yes. 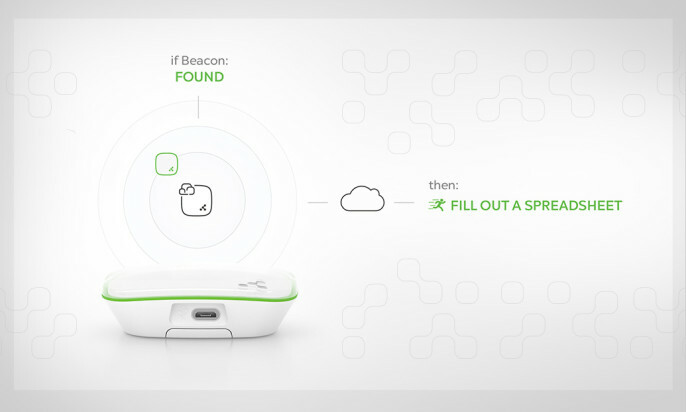 Using actual proximity to a beacon, Location Engine can recognize whether a tag is near or far. This data can be used to determine more specific location. Can Bluetooth beacons achieve accuracy of more than 1 meter? No. For use cases that specifically require very defined location information, ultra-wideband and other Angle of Arrival technologies can be used. However, these are not only significantly more expensive, they are often highly unnecessary for most use cases. Does Location Engine support third party beacons? The Gateway does receive data from third party beacons. However, it will receive MAC addresses instead of the Unique ID. The Unique ID is able to deliver additional information like battery level, making it far more useful. Thus, while third party beacons can be used, they will not deliver as much information. How do you map indoor spaces? Do you use a 3rd-party service provider to create the floorplans or you integrate with CAD files? At the moment we scale floor plans uploaded by customers and map Gateways relative to that. Relative positioning is also retrievable in the API. Room designation could also be attached via meta data to the Gateway so rooms can be matched in the backend. In this sense, we are less of a full solution provider for the end customer. Instead, we provide the tools for solution providers to make it happen. In two contiguous rooms with corresponding Gateways, how does the system differentiate in which room is the BLE beacon? The Bluetooth signal will not penetrate more solid walls, making it easy to differentiate in which room a beacon is located. If the signal does penetrate, the API provides the RSSI values to distinguish exact proximity in relation to the rooms. This is a great start to getting you on your feet with Location Engine technology. However, we couldn’t fit our whole 25-page in one blog post. Want to learn how to measure success or how you can use real-time data? Download the complete, easy-to-read guide so you don’t miss anything.